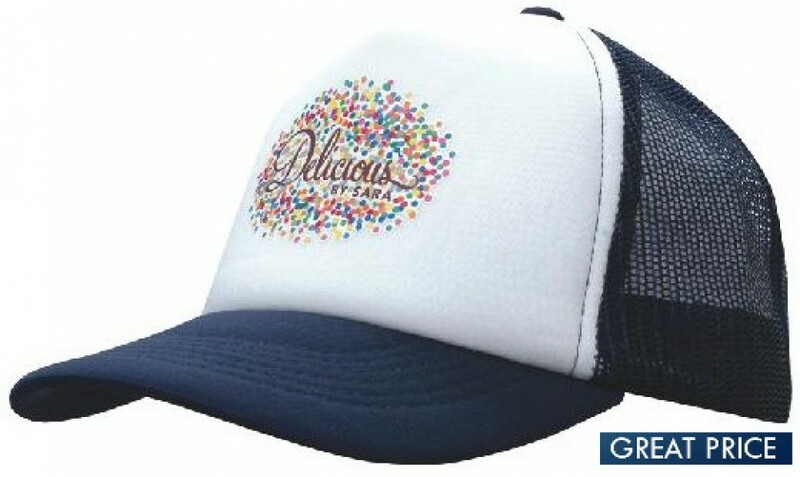 Looking for a great looking retro trucker-style cap? Look no further. This cap features a striking five-panel design with two large solid panels in front and three mesh panels which make up the sides and back. The two front panels combine into a large blank space, giving you a huge area on which to print or embroider your logo. The cap has a preformed bill as well as a structured front and the mesh will allow you to get plenty of hair to keep your head cool. This is a one size fits all as well thanks to the classic adjustable plastic strap. It comes in seven great colours, so you can pick the one that best harmonises or contrasts with your logo. With a simple style, a low unit price and a large branding area, these customised caps will be great for your next promotion. With an easy-care style, they make great uniform caps for your staff, with the cool all-mesh backing making them especially friendly for staff who work in kitchens and other hot environments. They also make great promotional sales items, suitable for gift-shops and other merchandise retailing situations. All products come with an 8000 stitch count embroidery as standard. Other branding options are also available -- ask our sales staff, or check out our FAQ. Listed price excludes GST and delivery fees. Please provide your branding artwork in .eps, .pdf or .jpg/.jpeg format. Ask us about our free digital mock-up service, to see what your design will look like on these cool caps.